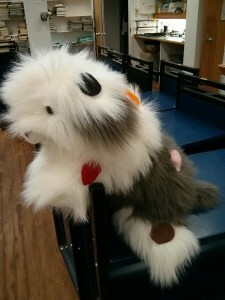 Last week I wrote about how I plan a storytime session. 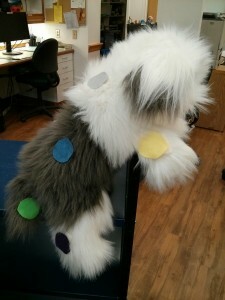 This week, I want to show in more detail how I retold the book Dog’s Colorful Day by Emma Dodd. The first way was through a felt story. 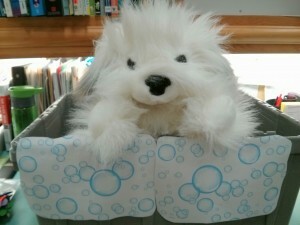 We already had the dog and the bathtub in my library’s felt story collection, but I wanted to make it a more complete retelling. If you’ve never made the dog before, here is a great printable pattern. Now ya’ll know I’m not the craftiest of children’s librarians. 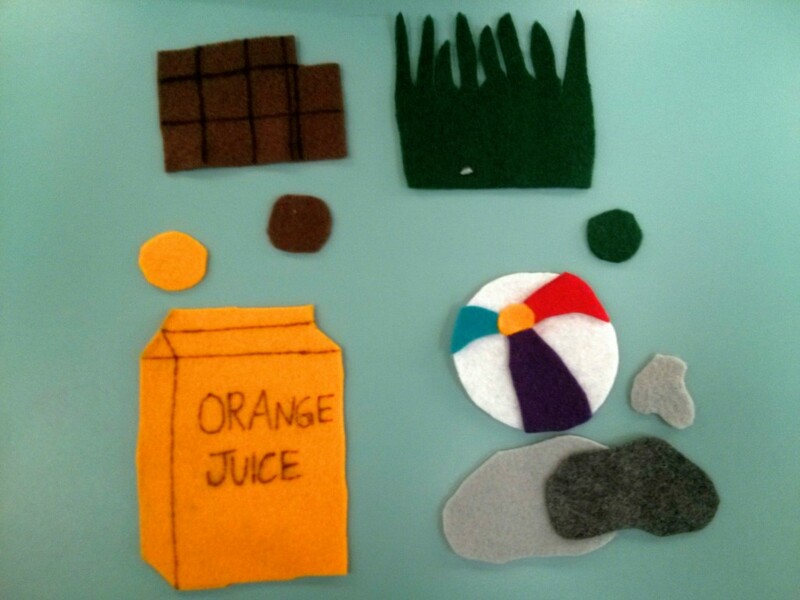 When charged with making my own felt story, I opt for the super simple. This one was super easy to make, I promise! I free-handed all of these pieces. They aren’t perfect, but kids don’t care and a little imagination never hurt anyone. 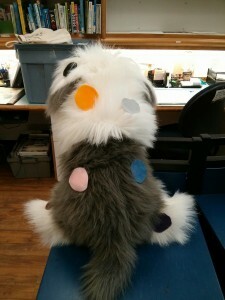 I made new spots to match the colours of the felt pieces. I was inspired a lot by this version I found on Etsy. The items are: a chocolate bar, grass, orange juice, a beach ball and a puddle, a marker, a bee, a can of paint, a jar of jam, and an ice cream cone. I’m particularly proud of the bee. When I did this felt story in storytime I used this AMAZING script to invite the children to participate by name. First I passed out the spots to the kids who volunteered. Amazingly, there were no tears, no complaints from anyone who didn’t get a spot. As I told the story, each child would come up and place the spot on Dog and we’d all clap for them. It took longer than the usual felt story, but it was so wonderful. The kids were quite pleased with themselves, even the toddlers. Not only did it celebrate turn taking, it also got the kids involved in the storytelling. The script has some great ideas for adapting this story to smaller or larger groups too. The second way we retold the story was through the use of a puppet. I found a big, shaggy, mostly white dog puppet. Then I cut out and stuck on velcro stickers. To the other half of the velcro sticker I attached coloured pieces of felt. 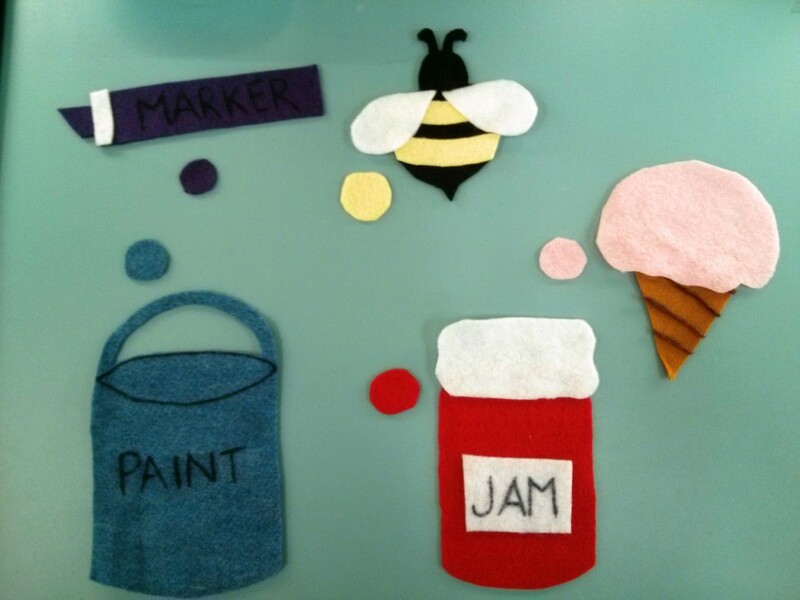 During storytime, I passed out the velcro felt pieces before starting the story with the kids. This time, I wanted to adapt it even further so I had the kids tell me what dog might have stepped on or rolled in or walked underneath in order to get each colour. Some of them remembered the items from the original story, but others came up with things like green apples, blueberries, leaves, and the sun. We also waited until the very end of the story to count all of dog’s spots since it was hard to see them all at the same time. For his bath, I decorated a shipping tote with some bubbles. I loved challenging myself to tell a story in three ways over the course of three storytimes. I highly recommend trying this out with your storytime groups. Thanks to Shawn at Read, Rhyme and Sing for hosting this week’s Flannel Friday! Check out her blog for the full round-up this Friday, and check out the Flannel Friday website for information on how you can participate. It’s our first post of the new year! We thought it’d be nice to take a look back at all we accomplished in 2015. I’m of the opinion that we, as children’s library staff, could do with a little more tooting of our own horns. We’re a pretty awesome group and we should take time to celebrate it. We had a great year blogging at Jbrary. We managed to publish a blog post every single week which I’m absurdly proud of, even if some of them were guest posts. Seriously folks, partner blogging is amazing. Here are the posts that standout to me as highlights of 2015. How do you incorporate early literacy “sprinkles” into storytime? It’s one of the most common and important questions we get asked. So I wrote up my answer and hosted a blog tour featuring 13 other bloggers sharing their methods of getting those talking points into storytime. This all developed organically out of conversations on Twitter and Facebook, and it was really cool to see so many people share their wisdom. Dana and I worked really hard in 2015 to connect with children’s library staff across Canada in order to showcase the work being done to serve Canadian children and families. We featured 16 guest posts from libraries in British Columbia, Alberta, Nova Scotia, Ontario, Quebec, Newfoundland, Manitoba, and Prince Edward Island. I loved learning about the services, programs, and communities that make up our country. As more libraries introduce baby storytime, we thought it would be helpful to write a series of posts about the key elements that make up storytime for our youngest patrons. We talked about the songs and rhymes we sing, the books we read, the play activities we incorporate, and the overall organization of a babytime. I’m really proud of us for completing the series before the end of the year. This post is probably one of my personal bests. As someone who works in a large library system and is disconnected from the book ordering process, I was so enthused to learn about picture books coming out this year. The positive response from the authors and illustrators floored me, and it was one of our most-viewed posts in 2015. We only participated in Flannel Friday three times in 2015, but I am really proud of all three! First, I shared a mega-round up of all the different variations of Little Mouse, Little Mouse I could find on the internet. I still go back and add to it when I find new ones. Then we participated in the Guest Post Palooza and featured Julie’s amazing STEAMY Flannel in Outer Space. Lastly, I added a ladybug version of Little Mouse to my repertoire. Cutest bunnies on the interweb if you ask me! One of my colleagues helped me create this super fun, super adorable spring bunnies scavenger hunt. If you missed it last year, definitely give it a try in a few months! It’s one of those things people can print and do in 10 minutes which is always appreciated. Dana and I continued to write our quarterly column for our province’s Young Adult and Children’s Section (YAACS). In 2015 we wrote about new blog discoveries, innovative summer reading club ideas, STEAM resources, and collection development websites. It’s really fun to shine the spotlight on others and this is one of the ways we do it. We ended the year with a round-up of over 50 picture books published in 2015 that work well in storytime. This post continues our end-of-the-year tradition, and it’s one of my favourite to write. I hope it stands as a resource for those of us looking to refresh our storytime collections. What a year! Thank you to our PLN for being awesome and joining us for this ride.